I finished decorating the side of the bathroom with the vanity, but the wall space above the shower hooks was glaringly nekkid. My husband even asked, “Aren’t you going to do any decorating in there?” So I knew I needed a plan. I wanted to hang a couple of white floating shelves, but I couldn’t find any on sale. The thrifty gal in me just couldn’t pay full price, but I didn’t want that bare wall ruining my bathroom makeover, so I had to come up with something. 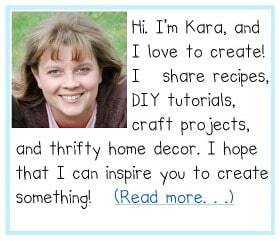 I scoured websites, craft sites, and blogs and couldn’t find anything that jumped out at me. Then I came up with an idea. 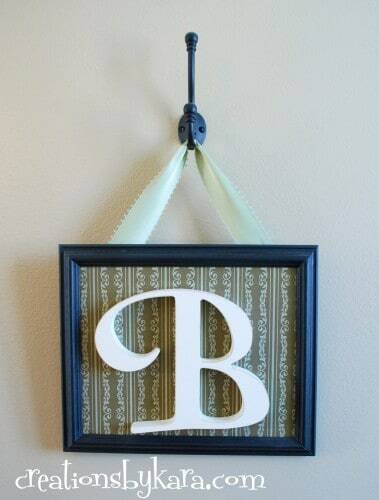 I had a wooden letter “B” that I bought with a 40% off coupon at Roberts. I was planning on doing something like this bathroom decor at All That is Good. But it wasn’t quite big enough. So I found an old frame that has been in storage under my bed for like seven years. Man did it have a lot of dust on it. Yikes! I cleaned it really well and then gave it a light sanding. Then I used black spray paint (surprise, surprise) and gave it a couple coats. I cut a piece of scrapbook paper, mod podged it to the cardboard backing and placed it in the frame. Glued on the letter B, and attached a ribbon to the top. I had a hook left over from my towel rack project, so I came up with the idea to hang it from that. In real life the B is actually centered top to bottom. I have no idea why it doesn’t look that way in the photo. This was super easy and really cheap. If I get tired of it, I can always change out the paper to give it a new look. So, do you have any thrifty decor projects hanging around your house? Feel free to comment about them or leave a link if you have blogged about them. I would love to see your ideas! !